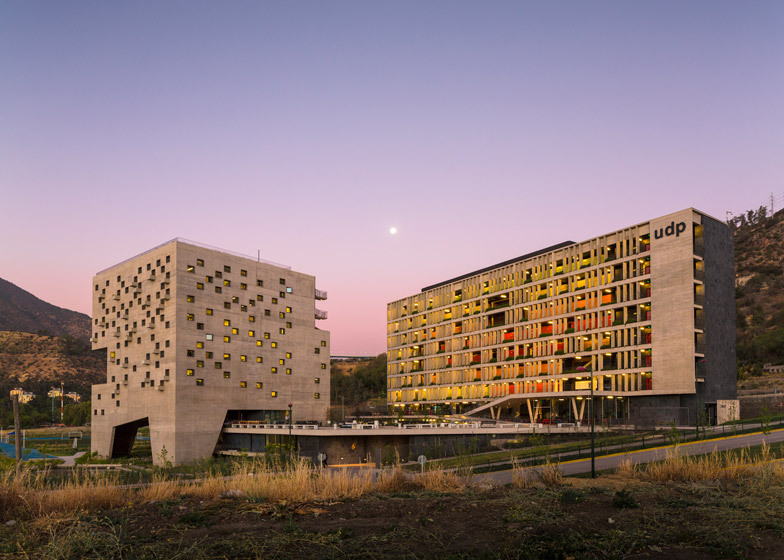 A team of Chilean architects has completed a new business faculty for Diego Portales University comprising a pair of concrete boxes with balconies and terraces slotted over, under and through them (+ slideshow). 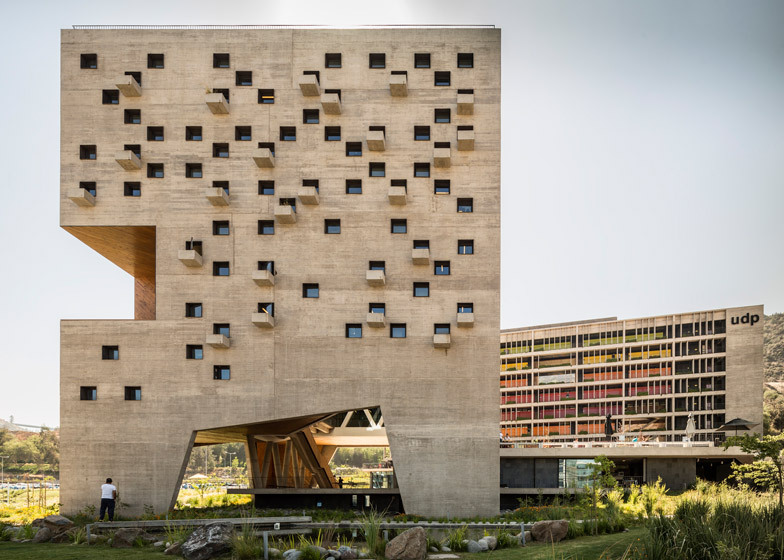 Working in partnership with architects Rafael Hevia and Gabriela Manzi, Duque Motta & AA designed the Economics and Business Faculty as the first phase in the construction of the Chilean university's new campus, located over the Huechuraba valley, just north of Santiago. "With the location of the new campus, the faculty seeks to build a strong link between its academic development and the professional reality, as it is at one of the most important business centres in the city," said the architects. 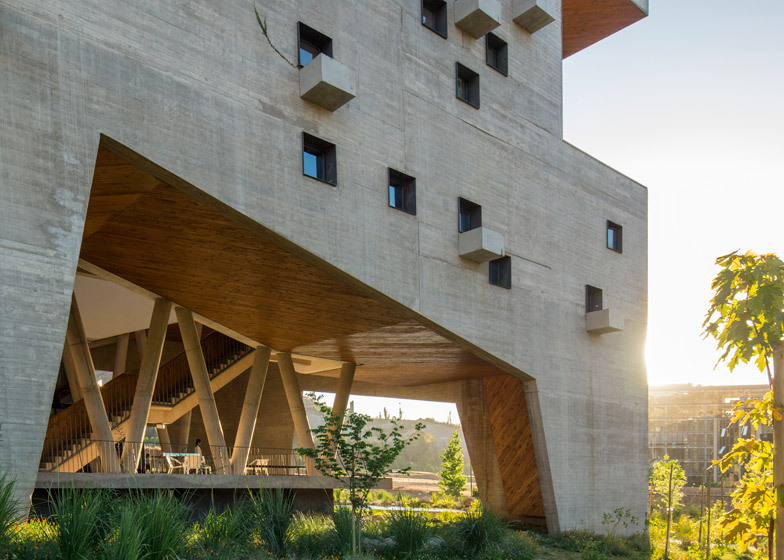 With an ambition to create structures "with weight that speaks of permanence and stability", the team designed a complex made up of three main blocks that are arranged around staggered terraces to follow the natural slope of the landscape. 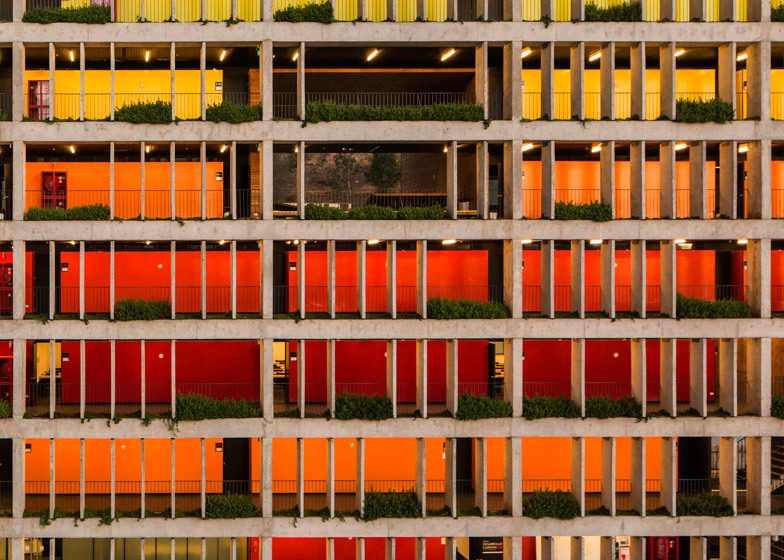 Rather than mimicking the glass-wall aesthetic that characterises many of the nearby office blocks, the buildings are predominantly built from concrete that has been left exposed on the majority of exterior walls. "The project seeks to build a connection beyond its neighbours, with its geographic environment," said the architects. 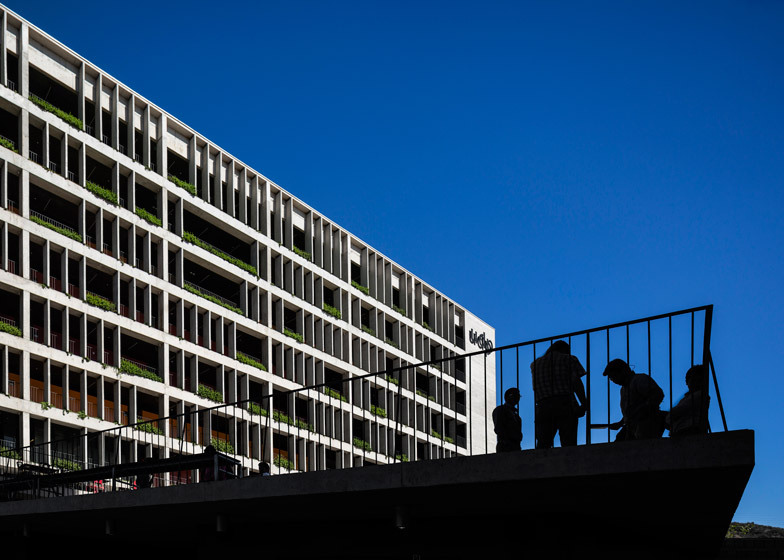 "It takes advantage of the slope to render the courtyards dominant over the territory, and builds terraces at different heights, as well as a roof garden, that connects the everyday life of the project with the distant geography." The base of the building, designed as multi-level podium, grounds the complex. This houses public facilities and shared facilities, including the school library, an auditorium and a cafeteria. Two blocks sit on top – one containing undergraduate classrooms and the other accommodating post-graduate studies and administration. These are connected by the first of the three terraces, located at the entrance, while the other two provide break-out spaces for the levels above. Eight levels of modular classrooms are contained within the long and narrow graduate block. 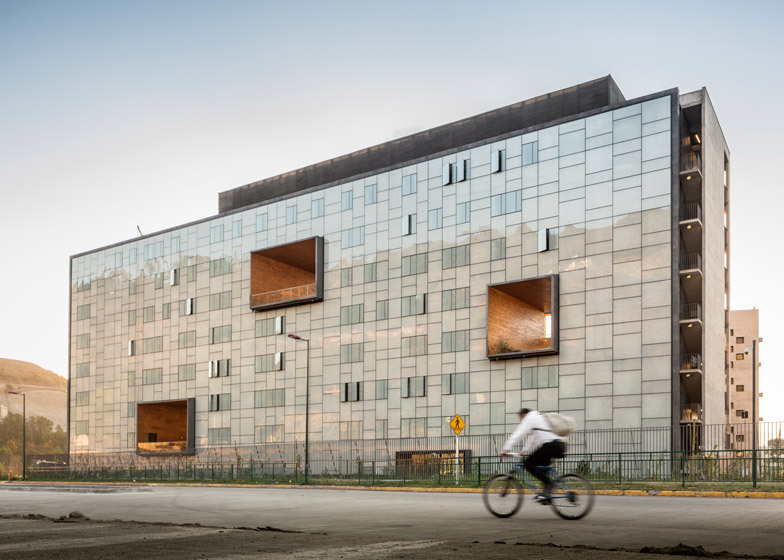 Outdoor corridors run along the west facade, screened behind large vertical louvres, but the east facade is clad with decorative glass that helps to moderate lighting and ventilation within. "The project is designed from the architecture, landscape, and technical facilities, in terms of savings in energy and water, minimising its impact on the environment, and insuring high standards of comfort for its occupants," said the architects. Double-height terraces puncture the volume in three places and perennial plants are encouraged to grow over the walls. In contrast, the graduate block features a square plan with a large courtyard at its centre and a garden on the roof. 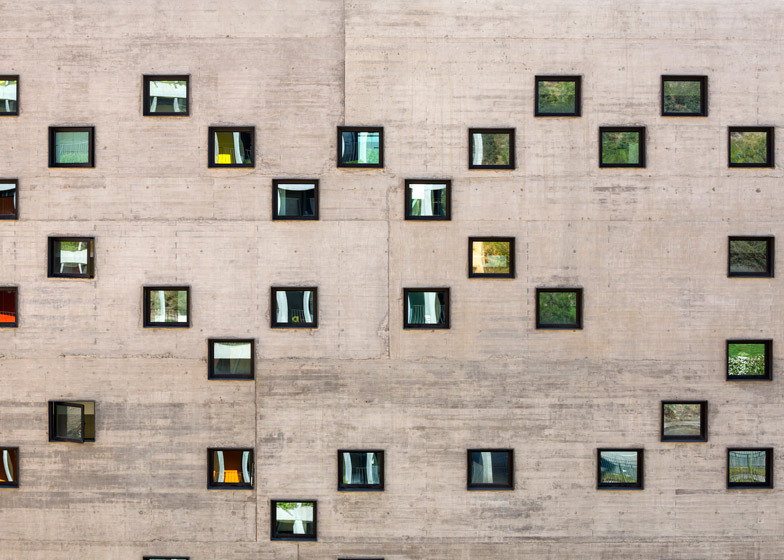 Walls are dotted with dozens of small square windows, and a void underneath offers shelter for one of the terraces. A new park surrounds the complex and offers sports facilities for students. 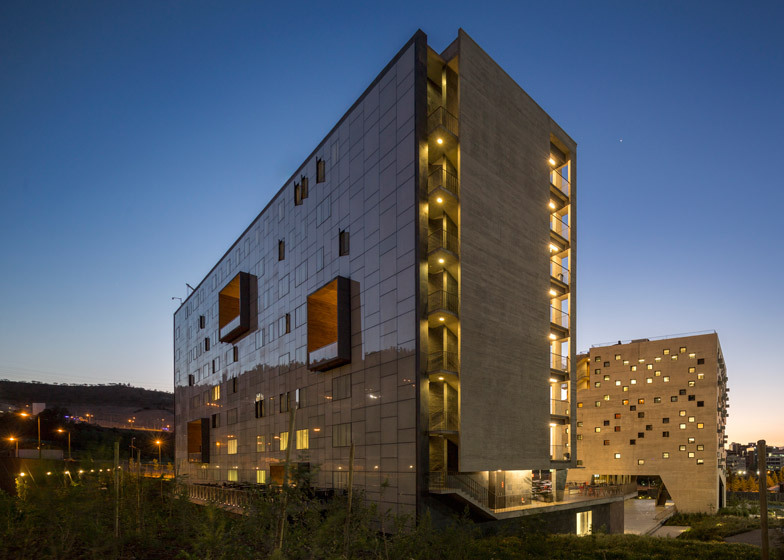 The project is the result of the competition for the revision of the new Huechuraba Campus masterplan, and the definition of the project for its first phase, the Economics and Business Faculty of the Diego Portales University. The site is located at the foot of San Cristobal hill, sloping and slightly raised above the Huechuraba valley. With the location of the new campus, the faculty seeks to build a strong link between its academic development and the professional reality, as it is at one of the most important business centres in the city. From the architectural point of view, this presented the challenge of asserting an academic identity in an environment governed by very different rules. 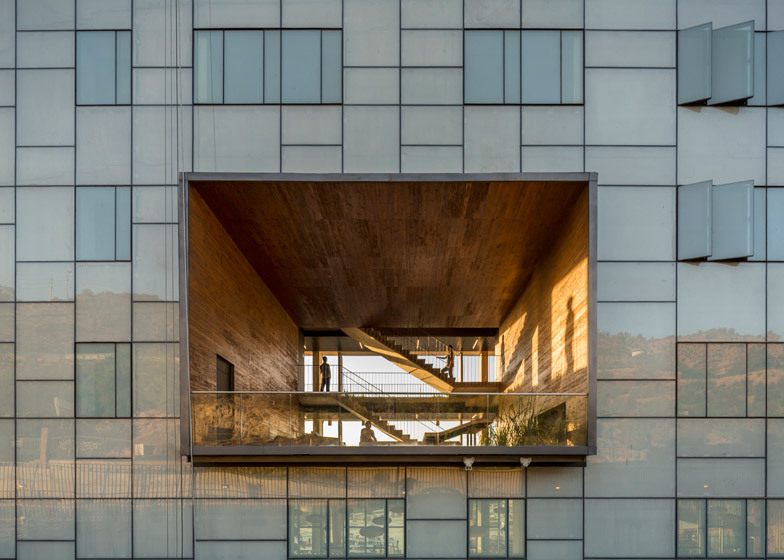 Amid buildings that are mostly for office rental, glass boxes lacking a clear identity and designed with a short term logic, the project wanted to build a contrast, a structure with weight that speaks of permanence and stability, to accompany the university in its long-range commitment and transcendence. The density of the volumes, the concrete that lasts and ages, walls to be covered with vines showing the passing of the seasons, a park that matures in years and stone courtyards, combine to consolidate over time. In addition, the project seeks to build a connection beyond its neighbours, with its geographic environment. 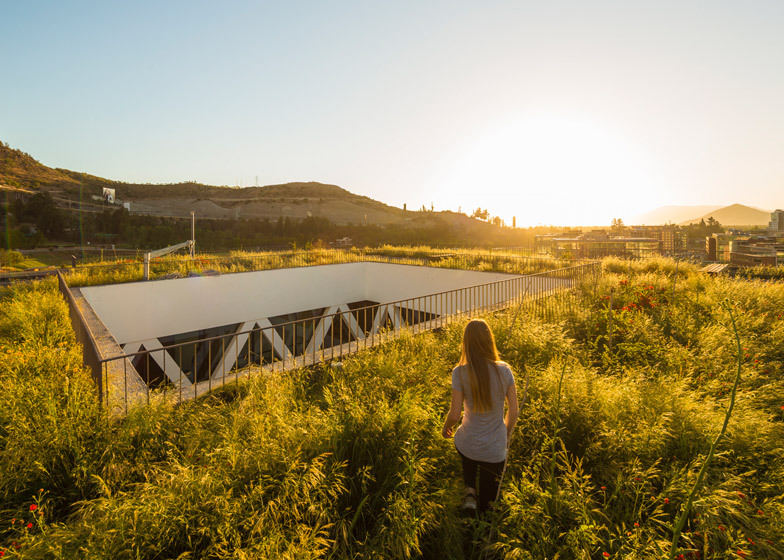 It takes advantage of the slope to render the courtyards dominant over the territory, and builds terraces at different heights, as well as a roof garden, that connects the everyday life of the project with the distant geography, San Cristobal hill, and Huechuraba valley. These are places that link leisure time with the surrounding landscape. The proposed masterplan combines four elements for the construction of the project, defining a section in the direction of the slope. The project of the faculty, as a first stage of the total, includes these four elements, advancing in its definition. 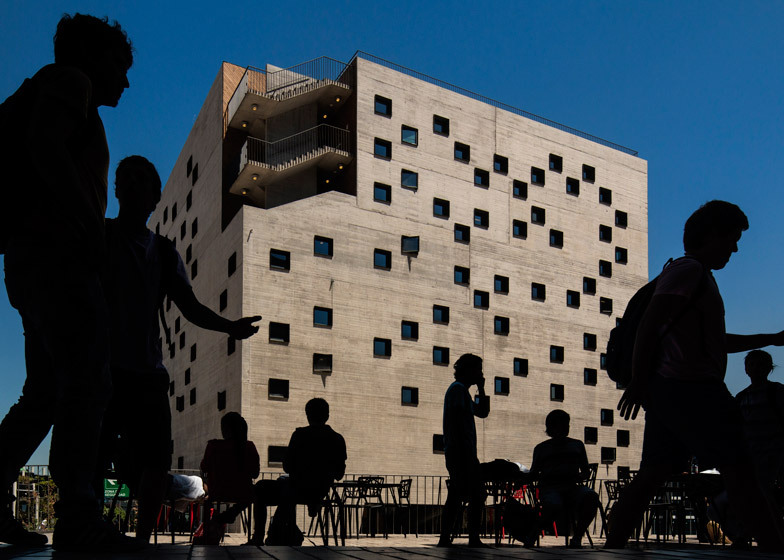 A basement formed by a linear succession of horizontal planes that builds the courtyards of intensive use, as balconies over the Huechuraba landscape, which houses the public programs of the university. In the first stage, the basement defines three different courtyards, the access square that connects the two main buildings of the faculty, the undergraduate square that connects to future phases, and the graduate square that is directly related to the park. Under these courtyards, the base houses a cafeteria, the school library and the main auditorium of the university. 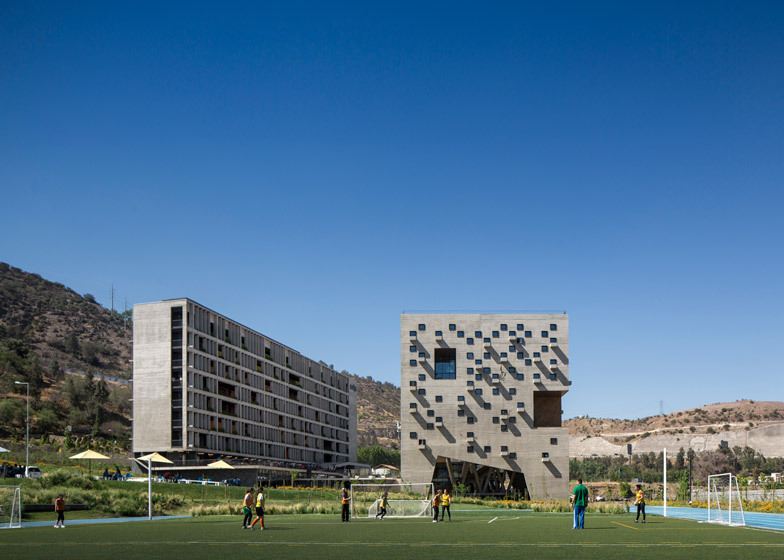 A large, eight level continuous bar, with neutral architecture, acts as a backdrop against the hill and houses the system of regular classrooms, which require more modular flexibility. For the Business Faculty, this building houses undergraduate classrooms which are organised by an exterior corridor overlooking the courtyards of the project, and linked to a series of raised terraces that cross the building, serving as spatial relief at the higher levels. On the base, and in front of the bar, the masterplan proposes a series of unique buildings that dialogue with the neutrality of the bar, establishing a scenic figure-ground relationship. These unique buildings give a certain rhythm and frame the landscape view from the courtyards. They also contain the most iconic programs of each unit, and their diversity gives identity to each part of the campus. At this first stage it houses graduate classrooms and academic offices. The building develops through a spiral configuration, which links the inclined graduate rooms at half levels, and offices on its upper floors, which organise their circulation around a central light void. 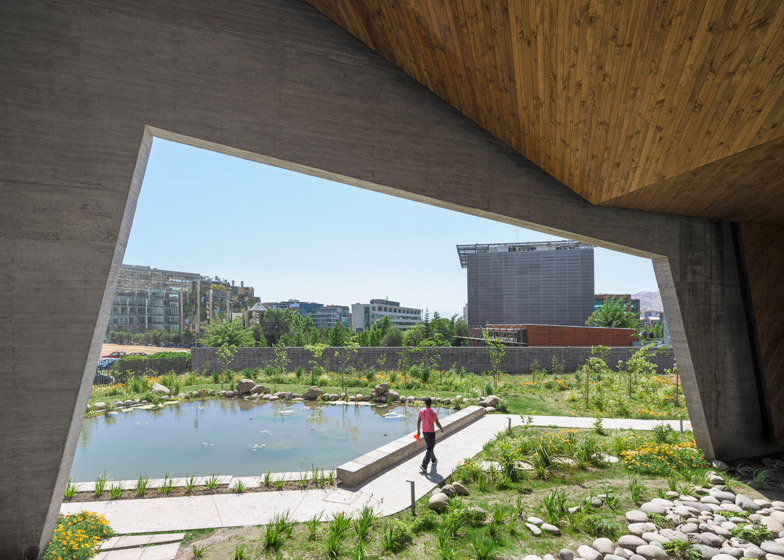 This building is elevated, leaving a large open space in its base that connects and articulates the higher program of the building with the courtyards, the park, and the territory. Finally, a park is defined on the lower area of the site that is intertwined with the base. It builds a safe distance with the existing urban area, and offers an extensive sports program. The project is part of a strong desire of the university to build environmentally sustainable infrastructure. The project is designed from the architecture, landscape, and technical facilities, in terms of savings in energy and water, minimising its impact on the environment, and insuring high standards of comfort for its occupants. 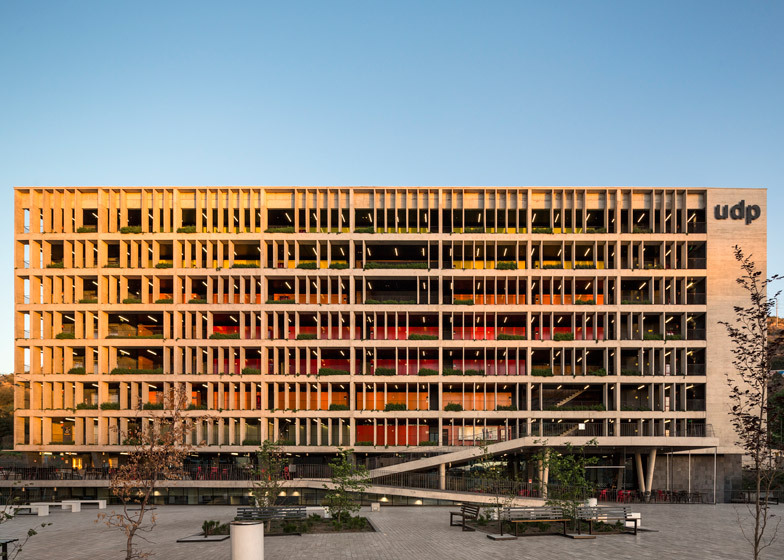 The building seeks to reduce solar impact on the shell: the exterior graduate walls are constructed with highly controlled openings, just enough for good lighting and views, and a central void for indirect light, around which the circulation is laid out. 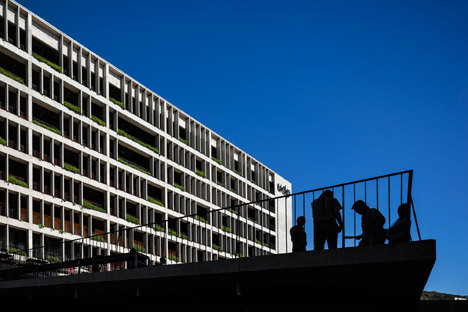 Furthermore, the building proposes a system of planters on the north and west facades, to grow deciduous vines that provide shade and humidity during the hot months, and a roof garden that acts as a buffer for thermal insulation. 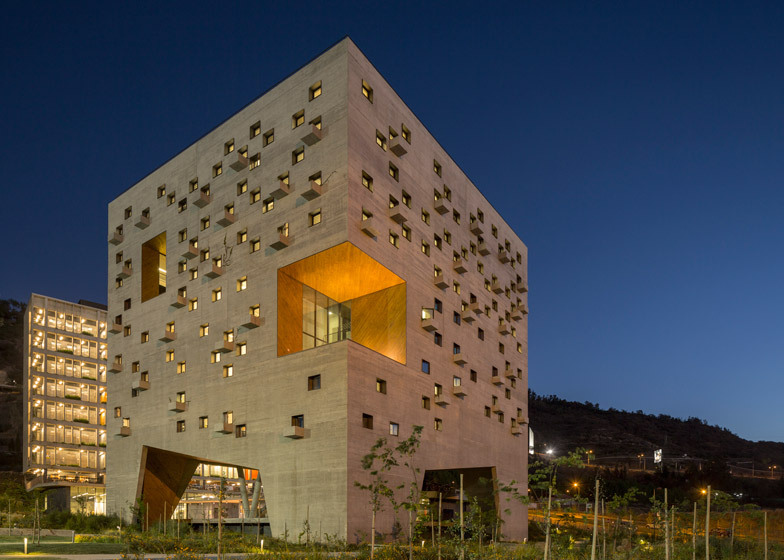 In the undergraduate building, the east facade is constructed from a concrete wall clad in decorated glass reflecting the hill and filtering light into the classrooms through controlled openings. To the west, a large vertical concrete lattice, with perennial vegetation planters, shading the corridor and classrooms. Finally, the building seeks to exploit the breeze from the west in the hot months, to generate cross ventilation in the classroom building and upward movement of air in the central void of the graduate building.